Starting to think about Mother's Day? Nordstrom has plenty of gift picks to get you started! There is also price matching on now for savings of 25% on select styles for everyone! 25% Off Men's Ray-Ban Sunglasses through April 17th! Pay tribute to her inner sparkle on Mother's Day with delicate crystal earrings, necklaces and more, starting at $38 at Nordstrom. FREE Shipping. FREE Returns. 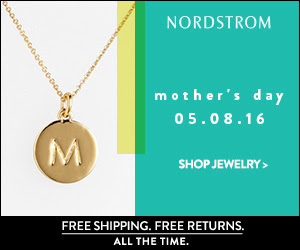 Celebrate Mother's Day with Jewelry Gifts starting at $38 at NORDSTROM. Choose from four FREE 7-Piece Deluxe Sample Sets, including a Harper's Bazaar cosmetics bag, with your $35 EstÉe Lauder purchase at Nordstrom. FREE Shipping. FREE Returns. Shop Estée Lauder at Nordstrom and Choose a FREE Gift with your $35 Purchase, including a Harper's Bazaar bag - a $130 Value! FREE Shipping. FREE Returns. Shop our picks from the Top Women's Contemporary Brands at Nordstrom, including Alice + Olivia, Elizabeth and James, Vince and more. FREE Shipping. FREE Returns. Shop our picks from coveted brands like Vince & more at NORDSTROM. SAVE 25% on Select Top Brand Styles for Women, Men, Kids & Home at Nordstrom, through 4/17 only! FREE Shipping. FREE Returns. 25% OFF Select Top Brand Styles through 4/17 only at NORDSTROM. Shop Nordstrom to find all of the style essentials you need to make the most of the season. FREE Shipping. FREE Returns.